A two-year long “Free Mojgan” campaign won the release of 22-year-old Iranian asylum seeker, Mojgan Shamsalipoor, from immigration detention on 21 September. The tireless campaign, lead by teachers and students from her former school, Yeronga State High School in Brisbane, faced down the government policy that has kept many Iranian asylum seekers in indefinite detention. Mojgan was a 20-year-old, senior student at Yeronga High School on a bridging visa when her claim for asylum was rejected in 2014. She was then re-detained and taken to the Brisbane Immigration Transit Accommodation (BITA). Mojgan was a victim of government policy that had seen more than 40 other Iranian asylum seekers re-detained at the end of 2014, despite the fact that the government knew Iran would not accept asylum seekers being forcibly returned. Despite numerous attempts, the Iranian government has consistently rejected moves by the Australian government to negotiate a deal to forcibly return asylum seekers. A campaign by teachers at the Yeronga school after she was detained meant that she was able to continue to attend school on a day-release basis from BITA. She was escorted to and from school, and subjected to searches by Serco detention guards. But, in August 2015, just three month short of graduating from high school, Mojgan was moved from BITA to Darwin detention after she spoke with the ABC for a report about her situation. The vindictive move by the Immigration Department not only threatened her education, it also separated her from her Iranian refugee husband, Milad. But the campaign of petitions, marches, protests and strikes has won Mojgan’s release on a bridging visa with work rights. Around 15 other Iranians who had been re-detained were also released the same day. 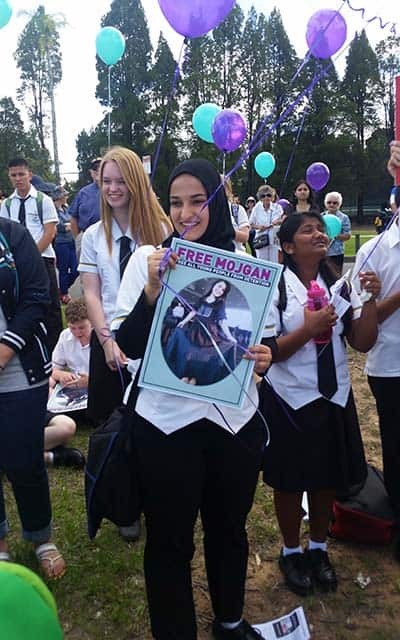 The “Free Mojgan” campaign also provided the impetus for involving the Queensland Teachers Union (QTU) in the refugee campaign. In 2015, the QTU and the Independent Education Union set up Teachers for Refugees and People Seeking Asylum (TRAPSA), to campaign more widely. Mojgan is free—although still denied a permanent visa—but other Iranians are still trapped in indefinite detention limbo on the whim of the Immigration Minister. The campaign has set a fine example. Now, we have to free them all—onshore and offshore.